What does it mean to outsource photo editing for e-commerce? In e-commerce, the creation of product images is a three part process: pre-production, production, and post-production. Pre-production is planning and preparing for a photoshoot, production is the photoshoot itself, and post-production is photo editing. Photo editing may also be called image editing or retouching. If you’re going to outsource image editing, it means after the photoshoot you will send your images to an external retouching service who will edit the images and then return them. A professional outsourcing service will align with your style guide so they can consistently edit your images and match your aesthetic. “Editing” can cover a wide variety of actions. Basic photo editing includes removing the background, creating clipping paths, aligning products consistently within the image canvas, setting consistent margins, cropping, compressing images, setting aspect ratios along with image width and height, and converting to file types like jpeg and png. More advanced outsourced image editing services will also provide retouching. The line between photo retouching and photo editing is heavily blurred, and some people use the terms interchangeably, but generally speaking in retouching the product itself is being manipulated within the image. For example, e-commerce images can benefit from wrinkle and crease reduction, model skin retouching, adjusting shadows, and product cleanup (like pin, scuff, dirt, and lint removal). For more specifics, you may want to refer to this product image retouching glossary. Why outsource photo editing for e-commerce? All product images, almost without exception, will be edited. The choice most growing brands, retailers, and photo studios face is whether to outsource photo editing or do it in-house. Photo editing has traditionally been done in-house by brands and retailers or by the photo studio hired to shoot e-commerce images. What some brands and retailers hiring commercial photo studios don’t realize is that most studios are already taking advantage of outsourced photo editing for photographers. The reason is simple: outsourcing works. When done properly, with a careful review and selection process, outsourcing will not only save you money on image editing, it will improve your image quality and get product images online faster. Editing images in-house presents several challenges that have long frustrated studio operators. Because apparel photography in particular is seasonal and often catalog oriented, there are huge variances in photo production month to month and week to week. That makes staffing the right number of in-house retouchers an impossible challenge: they’re generally either idle or overworked. Most companies have to hire additional freelance retouchers during busy times. If you outsource photo editing, you don’t have to worry about seasonal swings. 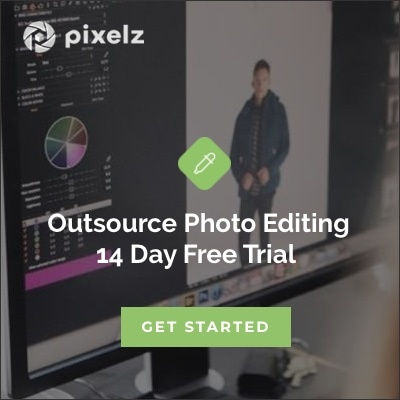 A professional outsourced image editing service should enable you to scale: your process shouldn’t change whether you have 100, 1000, or 10,000 photos to edit per day. Additionally, when pricing is aligned with your image volume, you’re only paying for photo editing when you actually need it. Retouching, like many jobs, is a mix of artistry and diligent grinding. Some image editing, like skin retouching and recreating areas of the product covered by props, is challenging and stimulating for a skilled retoucher. However, a lot of image editing, like creating clipping paths and removing the background, is relatively low-skilled and time intensive. If you’re doing photo editing in-house, because you will likely only have a few retouchers, they all need to be capable of doing every single retouching task. More advanced skills mean higher salaries, and it also means they’ll get bored clipping images all day. That leads to employee turnover and the associated expensive hiring and onboarding processes, along with difficulty in keeping your post-production team staffed enough to avoid bottlenecks. Pixelz provides step-by-step Photoshop logs of edited product photos; each step is performed by a specialist. At Pixelz, we’ve taken a different approach to the traditional single photo editor per photo to be edited. Our outsourced image editing service is built on our proprietary digital assembly line, S.A.W.™. We break photo editing down into component steps, completed by a blend of automated processes and specialist editors. That means we’re able to appropriately match photo editor skill level with Photoshop tasks, so that highly skilled editors are doing more stimulating work. Less experienced editors can specialize in more entry level edits while they develop their skillset. S.A.W.™ also means you’re only paying for skills that you actually need. When you use our outsourced photo editing service, you’re paying per image with a price determined by the complexity of the job. When the number of retouchers you need fluctuates constantly and you have high turnover, the time it takes to edit photos is going to be a bottleneck. A delay of weeks or even months between a photoshoot and uploading edited photos to your website has a significant cost in lost sales and relevance. If you outsource photo editing, you can eliminate bottlenecks. An established, reputable outsourced photo editing service should at a minimum deliver images in 24 hours or less. At Pixelz, a “next morning” turnaround time is common (upload before 6:00 p.m. your time and they’re back by 10:00 a.m. next business day), with 3 hours or less available. That’s faster than an in-house team could complete image editing, no matter how many retouchers you have on staff. The nature of time-shifting BPO (Business Process Outsourcing), with photo editors located around the world and editing images around the clock, means if you outsource photo editing work on your images won’t stop until they’re done. How to outsource photo editing for e-commerce? The single worst way to select an outsourced image editing service is to simply take the lowest quoted per image price. Quite apart from the high probability low outlier bids are promising something they won’t deliver, you’re ignoring the Total Cost of Operation (TCO). BPO success, including photo editing outsourcing, should be determined by its total cost to you. That cost is measured in more than cents per image: it’s management, turnaround time, workflow efficiency, reputation, and image quality. In other words, it doesn’t matter if you’re paying 10¢ an image if that image is crap, comes a week later than promised, and takes hours of calls and emails to correct. If you’re planning to outsource photo editing, you should ask the following questions of any potential outsourced photo editing service. How do I communicate my style guide? How do I learn to use your system? Do you have a technology based system? What is the online interface like? How do I give photo editing instructions? How do I rush orders? Are there quality assurance tools for proofing edited images? Can you scale with my needs? Who are you already working with? Are you an e-commerce specialist? What’s your Corporate Social Responsibility policy? Who is actually editing my images? What is your worker retention rate? Where are your former workers? 1. What’s your onboarding process? An outsourced image editing service should have a defined step-by-step process for new customers. The editing company needs to learn your requirements and you need to learn how the photo editing is done so you can understand how best to use the system. Onboarding can be an online tutorial or wizard, if your needs are consistent and the outsourced service’s system is well-defined. It can be more in-depth, involving calls, meetings, and on-site visits where style guides are defined. The important thing is that you and the service understand each other before you go gung-ho and upload 10,000 images. Ramp up photo editing at a controlled pace. Onboarding methods and intensity can vary depending on the complexity of photo editing requirements, but if there’s no onboarding process at all you’re going to have a very rough start. 2. Do you have a technology based system? Many outsourced photo editing services are essentially a bunch of guys in a warehouse with Photoshop, pulling batches of images from a shared folder. Prioritization and skill matching either doesn’t happen, or happens on an ad-hoc basis as a supervisor applies their best judgement (“Hey Sanjay, stop what what you’re doing and work on this rush order!”). This results in an inconsistent, opaque, and unresponsive photo editing service. Even worse, photo editing requirements are communicated by PDF, Word Doc, or email on a per order basis and then relayed third-hand, verbally. There’s no ability to quickly review and change how images are edited, add comments to a single image or order, or check on the status of an order. The final insult and injury comes at the QA phase, when completed images have to be reviewed one by one in Photoshop and rejections painstakingly detailed in a local document before restarting the whole process. That’s why you need a technology based system. You need something intuitive, powerful, and built to scale photo editing. Pixelz’ digital assembly line technology, S.A.W.™ (Specialist Assisted Workflows), is a smarter way to edit product images. Image editing is broken down into component steps completed by specialist editors and automated processes within a proprietary Photoshop client, with artificial intelligence serving as traffic control. A system with total awareness of what’s currently happening to every single image, along with accompanying deadlines, ensures images are completed on deadline and can be expedited without any disruption to the overall system. The ability to quickly create detailed custom specifications in an online system gives you more control when you outsource photo editing than you had in-house. Uploading a few images, assigning them to a specification, and clicking an “expedite” button that guarantees an order is edited in 3 hours or less is even faster than walking across the office and explaining what you want done to Jim in Retouching. Comment before production or when rejecting completed images. Visual markup tools improve communication for outsourced photo editing. Online commenting and quality assurance tools allow you to communicate photo editing needs quickly and visually, in the moment. Apply comments on a per image or per order level, or create a new spec to have it available for future orders. Rejections are clearly marked and tracked to your order, and bumped to the front of the queue. A technology based outsource photo editing service can scale, because systems aren’t stressed by volume. Organization, simplification, and automation create efficiency. 3. Who are you already working with? First, you want to make sure that any outsourced photo editing service for photographers is for your kind of photography. For example, Pixelz is an e-commerce specialist: we only edit product images. Many BPO services try to be everything for everyone, but e-commerce, wedding, lifestyle, food, and nature photography are all very different—a bride and a tube of lip gloss have completely different retouching challenges. Second, take a look at the outsourced photo editing service’s client list. If they don’t have a published one, why not? A reputable, established company will have endorsements, case studies, and reviews. Do you respect the photography of the brands, retailers, and photo studios they work with? You don’t want be a copycat, of course, but an outsourced photo editing service that’s already working with leaders will have passed through more rigorous review and stress than a new kid on the block. They’re also more likely to stick around; you want a long-term relationship so you don’t have to repeat the outsourcing selection and onboarding processes again in a few months. 4. How do you treat your employees? There are plenty of horror stories in outsourcing, yet for some reason people keep making the same mistakes, ignoring TCO and chasing cut-rate exploiters. This is unfortunately as true of BPO as factory work. Sure, outsourced photo editing for photographers isn’t as obviously dangerous as sewing apparel in an industrial complex, but there are still risks to vulnerable workers—and your brand. Put in the research to ensure you select an ethical outsourced photo editing service and mitigate the risk to both workers and your reputation. Apart from the obvious ethical and legal concerns, simple logic should tell you that happier workers produce higher quality. If you really want to know how a company is operating, it’s not hard to find out. See if you can visit. Review their CSR policy. Ask questions: Who am I actually working with? What is your worker retention rate? Where are your former workers? There’s tremendous churn in many BPO companies, because they’re not thinking long-term and they have unhappy, underpaid workers stuck in a dead-end job. An intelligent company realizes that outsourcing is just like any other field: the most talented workers find the best jobs, and are motivated by acquiring new skills and advancing their careers. For example, an intelligent outsourced photo editing service will skew towards youth acquiring digital and soft skills—through courses offered by the company—like leadership, english, and business management. You should see high retention rates, with workers remaining at the company for several years as they progress. The outsourcer will promote from within, with clear paths for advancement, and have locals in trusted leadership roles. They will take pride in workers who do move on to key positions at other companies. At Pixelz, we believe in Impact Sourcing and are members of the Global Impact Sourcing Coalition. Our approach is built around four simple truths. Read more about Pixelz’ Impact Sourcing model.